Write to witness. Write to remember. Write to liberate. The writing hand is a fist formed to harness the power of creative potential. Incorporating a variety of healing practices and writing prompts, we gather to cultivate community and celebrate our resilience, healing, and survival. 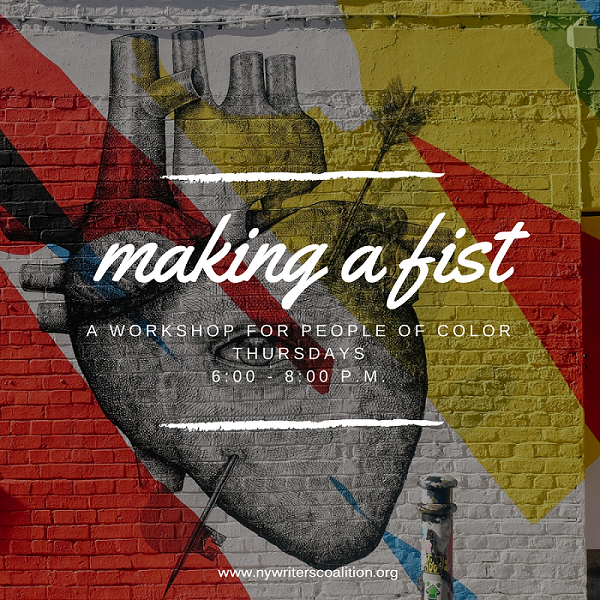 Making a Fist is a self-care oriented writing workshop for people of color (POC). I began offering this workshop series in 2017 as a healing space for BIPOC to come together and build community over their creative expression. Making a Fist is an ongoing, free, weekly writing workshop exclusively for BIPOC. I had felt a need to create and share a space that blended my healing and creative practice. I wanted to create an affirming container that I saw missing from most creative writing spaces that often focused on a disembodied, individualistic writing process. Inspired by Naomi Shihab Nye’s work and countless other revolutionary writers, I created Making a Fist to share my particular writing methodology and ritual practices. This writing space space incorporates a variety of healing practices and prompts for writing. It is a space that affirms and uplifts queer and trans folx; it honors earth-based practices and traditions; the wisdom of plants, the cosmos, and the ocean. Each month's writing themes revolve around the lunar cycle and corresponding zodiac sign, herbs, a body system, somatic and/or sensory exercise. Together, we explore writing as an embodied ritual beyond the written word in order to tap into our radical imagination and affirm our capacity to heal. If you’re interested in joining us, check out the New York Writer’s Coalition website to apply.